There is a time change for today's session of Rethink Diversity Through Mindshifting Dialogue. Instead of starting at noon, the session will begin at 11:00 a.m. and end at noon. Please join us today for Cat calls, Compliments, and Come Ons: A conversation about sexist microaggressions. Please RSVP by e-mailing lw161@evansville.edu. For more information contact LaNeeca Williams at lw161@evansville.edu or ext. 2413. This event is sponsored by the Office of Diversity Initiatives. As the fall semester and the start of school is just around the corner, Copy Services asks that you start submitting requests for fall manuals and handouts in June and July as you have them ready. The start of school is busy for everyone, so early summer is a great time for Copy Services to process copy jobs and have them ready in plenty of time for the start of classes and/or for purchase from the UE Bookstore. Your efforts and cooperation are greatly appreciated as we prepare for a great 2016-17. Copy Service Requests and instructions are available on the AceLink website. If you have questions, please contact Distribution Services at ext. 2197. Just a reminder that if you rented a book for Summer Session I you can return it to the UE Bookstore upon the completion of your class. If you're off-campus and can't make it to the Bookstore you'll be able to return the book when you come back for fall classes. But it must be returned no later than the first day of fall classes. If you have questions, please call the Bookstore. Employees of the University of Evansville are invited to play golf with other UE employees on Thursdays at 3:00 p.m. at Fendrich. You can reserve your tee time by contacting Debbie Kassenbrock in the Center for Academic Advising at dk26@evansville.edu by 4:30 p.m. on the Wednesday prior to the outing. The June Pcard cycle that began on May 24 will end at midnight on June 21. June cycle reports may be run on June 23 and printed. The GL will upload on June 28. The ACE3 program, a microloan program administered by the Institute of Banking and Finance in the Schroeder School of Business Administration, is pleased to announce a new client: My Funding Alliance (MFA). My Funding Alliance is owned and managed by a local entrepreneur, and has the goal of bringing cause marketing to Evansville. Cause marketing is a new concept of marketing that involves three different segments: local businesses, nonprofit organizations, and consumers. MFA provides a platform for consumers to unite with local businesses and support community causes. Consumers go to MyFundingAlliance.com and purchase gift vouchers. Upon redemption of the voucher at participating local businesses, five percent of the proceeds go to the nonprofit. Members of the University of Evansville community were among the recipients of this year’s Arts Council of Southwestern Indiana Awards. The awards were presented today at a ceremony at the Bower-Suhrheinrich Foundation Gallery at the Arts Council of Southwestern Indiana in Evansville. Steve and Susan Worthington received the 2016 Mayor’s Arts Award given to recognize talent, hard work, and dedication to the arts over a lifetime of service in and around Evansville. Steve, a graduate of UE, and Susan belong to every organization at the University that supports the arts. They are members of the board of directors of these groups and give their time and energy to support events and initiatives developed by the organizations. Both have been recognized with awards from the University. The Worthingtons are long time volunteers and patrons of Willard Library and the Evansville Museum. Steve is a member of the museum’s board of directors, and Susan is an active member of the Bethlehem United Church of Christ’s bell choir. The winner of the Arts Council’s ensemble award was the Eykamp Quartet, a group supported by the Eykamp family, the Evansville Philharmonic, and UE. This resident quartet - comprising Robert Anemone. Alicia Choi, Rose Wollman and Kirsten Jermé - enriches the musical, cultural, and educational activities of the Evansville community. The group is the resident quartet at UE, where they perform in the Tuesday Night Concert series and in special concerts. They work with the UE Symphony Orchestra, volunteer masterclasses for string majors, and adjudicate end-of-semester juries for students. The quartet serves as principal players in the Evansville Philharmonic’s string section, participates in Philharmonic education and outreach programs, and works with the Philharmonic Youth Orchestras. Anne Hastings Fiedler, UE’s Oramay Cluthe Eades Distinguished Professor of Music and head of the keyboard area, received the Artist Award. Since her arrival at the University, Fiedler has been a major contributor to the Evansville musical community. She accompanies UE music faculty members when they give recitals in the community. She performs more each academic year than any other UE music professors, as so many ask her to be their accompanist at their solo recitals. Fiedler, principal pianist for the Evansville Philharmonic Orchestra, was a finalist and prizewinner in the National Beethoven Piano Sonata Competition and has collaborated nationally with soloists and ensembles. She has been a featured soloist with the Evansville Philharmonic Orchestra, the Evansville Chamber Orchestra, and the UE Orchestra. The recipient of the Arts Advocate Award was Robert Shetler, who has contributed much to the area’s artistic and cultural landscape. As owner of Shetler Moving and Storage, he has offered free transportation of UE Theatre’s sets, lights, and costumes, including the many times it has performed at the Kennedy Center’s regional and national festivals. His moving company played an integral part in the opening of the Red Skelton Museum in Vincennes, Indiana, making many trips from Los Angeles to Vincennes with items for the museum. Shetler also serves as a member of the museum’s board of directors. Shetler personally made arrangements for artifacts to be moved to the Evansville African American Museum, and as chairman of WNIN’s annual auction, his fleet of trucks and drivers picked up and delivered auction items. He supervised the move of the Children’s Museum of Evansville T-Rex from Indianapolis to Evansville, and moved the Evansville Philharmonic into their new offices. Recently Shetler coordinated the move of two large paintings and more than 300 pieces of eighteenth-century porcelain to the Reitz Home Museum. Beavers to publish "A Brief Introduction to the Philosophy of Information"
Anthony F. Beavers, professor of philosophy and director of the Cognitive Science Modeling Lab, has been asked to publish his paper, "A Brief Introduction to the Philosophy of Information," in the September Issue of Logeion - Information Philosophy. The paper has been circulating on the web for the past six years and has been viewed more than 3,000 times on Academia.edu alone. It has become standard reading in many philosophy of information courses worldwide. Logeion is published by the Philosophy and Policy of Information Research Group of the Brazilian Institute of Information in Science and Technology. 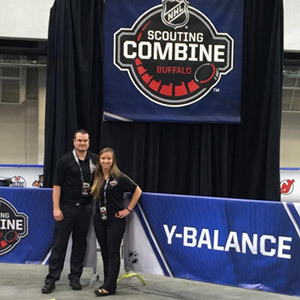 University of Evansville faculty and Sports Residency Program instructors Kyle Matsel and Jenna Gourlay administered the Y Balance Test to professional hockey prospects at the 2016 NHL Combine in Buffalo, NY. The Y Balance Test was developed and extensively researched by Phil Plisky, assistant professor of physical therapy and Sports Residency Program director. The Y Balance Test is used test a person’s motor control, as well as to demonstrate functional symmetry. It is used by professional, collegiate, and high school sports teams, as well as military, industry, and researchers worldwide. Noah Gordon, assistant professor of biology, has been quoted in a National Geographic article on frogs. To read the article and Gordon’s quote online, go here. On June 5, Dennis Malfatti, associate professor of music and director of choral activities, conducted a concert at the historic Carnegie Hall in New York City, along with students from UE’s choral program. The concert featured The New England Symphonic Ensemble (an east-coast based professional orchestra), and a chorus of over 120 voices in a program of choral-orchestral works by Mozart and Haydn. The chorus was made up of singers from several different choirs from Indiana, Ohio, Pennsylvania, and Virginia. Thirty students from the UE choral program made up the core of the 120 voices. The 30 singers from UE, representing the UE University Choir, the UE Mixed Choir, and the UE Women’s Chorus, began rehearsing in March for this rare opportunity. All the participating choirs, each of which learned the music for the program with their own directors, met in New York City two days prior to the concert for two combined rehearsals as well as a rehearsal with the orchestra all led by Malfatti. Carnegie Hall is the most famous concert hall in the United States and one of the most famous halls in the world. Nearly every major classical music artist of repute from the last 100 plus years has performed there. This recent performance was the second time Malfatti and students from the UE choral program have been invited to perform on the storied stage of Carnegie Hall, having performed a similar concert in 2011. Purple Aces assistant volleyball coach Jose Reyes has assumed an important position for the summer as he is currently working as the team manager and statistician for his native Puerto Rico at the 2016 FIVB World League. Reyes is working for Puerto Rico in the twenty-seventh edition of this event, which is one of the most prestigious tournaments in the world. His squad began the tournament in group three last week and played in a pod that also consisted of Kazakhstan, Greece, and Chinese Taipei. They currently stand at 1-2 as they defeated Kazakhstan in the first round of action. Week two’s action sees the team remain in Greece in a pool that features Slovenia, Greece, and Qatar. The twenty-seventh FIVB World League is the largest in its history with 36 teams participating. Action began on June 17 with the Intercontinental Round and culminates on July 17 with the World League finals. Reyes assumes a number of duties with the team including team operations, data and video analysis, and scouting reports. University of Evansville Women’s Soccer player Alexandra Arguello has been named a 2016 Missouri Valley Conference postgraduate scholarship winner. The Missouri Valley Conference Faculty Athletics Representatives Committee voted to award postgraduate scholarships to four student-athletes, due to their exemplary academic and athletic performances. Each will receive a $5,000 postgraduate scholarship from the Conference. Arguello, a native of Las Vegas, Nevada, earned a spot on the 2015 MVC All-Tournament Team and was also named a Second Team All-Conference player in 2015. She played in 18 matches and tied for second on the squad with seven points while also tying for the team high with three goals. Arguello notched 32 shots (second on the team) and netted a penalty kick for the game winner in a 1-0 win over Missouri State. She earned the MVC Commissioner's Academic Excellence Award in each of the last three years and is also a 4-time MVC Honor Roll member. Arguello completed her undergraduate degree at Evansville with a 3.94 GPA in Biology and was a President's Council Academic Excellence Award winner this spring. She is pursuing a Doctor of Allopathic Medicine degree and plans to attend the University of Nevada. To be eligible for consideration, recipients must have achieved a cumulative grade-point average of at least 3.40, participated with distinction in a Missouri Valley Conference championship sport for at least two seasons at the nominating institution and must graduate from their institutions within 18 months following selection at the spring meetings of the Faculty Athletics Representative Committee. Also, the recipients must be accepted for postgraduate studies at an institution of higher learning at the time of receipt of the scholarship. And, the recipients must have completed eligibility for participation in intercollegiate athletics in the academic year in which nominated.